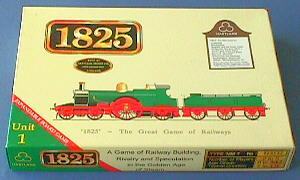 1825 is produced by Tresham Games in the UK (under licence to Hartland Trefoil, i.e. MicroProse). It should be available in the usual Hobby Shops but it has been very sporadic in its appearance, partly due to the fact that Francis Tresham hand finishes a lot of the components. The cost in the UK is around £25 (when it was first released it was at a special offer price of £18.25).